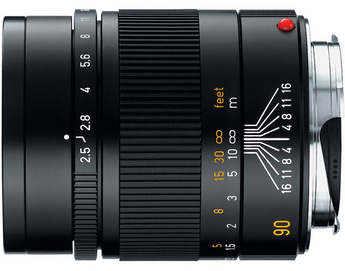 The Leica 90mm Summarit-M f/2.5 is a telephoto length, manual focus lens for the Leica M9 Rangefinder. This lens sports 6-bit coding which allows the digital M camera to read lens info optically. It is sharp with high resolving power. It is a versatile lens that keeps the M camera compact and is ideal for portrait and documentary photography. • When used on an M8, the effective focal length is around 119mm because of the 1.33x crop factor.